Roofing Contractors MidSouth Construction is certified in all types of metal roofing! Metal roof repairs or replacement! 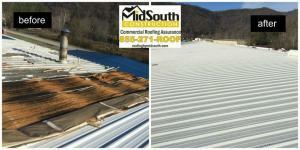 MidSouth Construction is a metal roofing contractor certified in all types of metal roofing! Visit our portfolio page to see some examples of our metal roof replacement projects! We are not just a roofing company but a full service general contractor. We can manage your metal roofing project from beginning to end. A metal roof will take your property from the ordinary to the extraordinary! 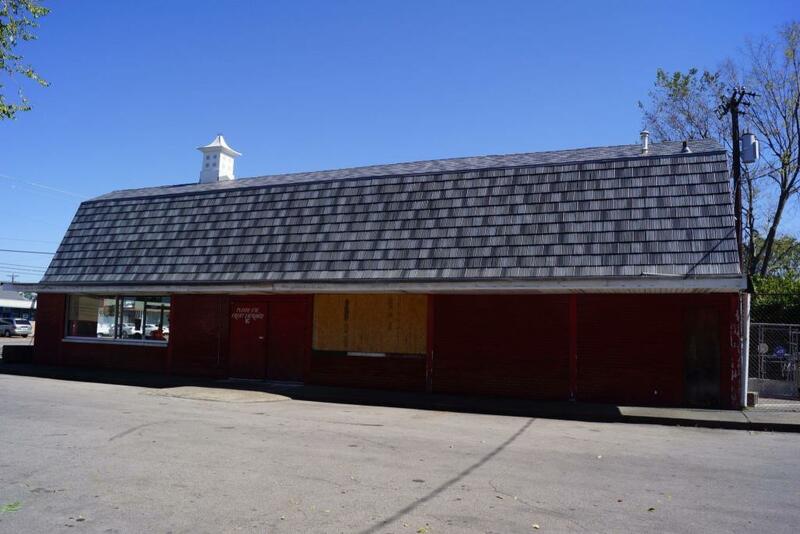 Metal roofing offers a good value to commercial property owners but must be installed by a knowledgeable metal roofing contractor. All metal roofing is considered “cool roofing” by the US Environmental Protection Agency. 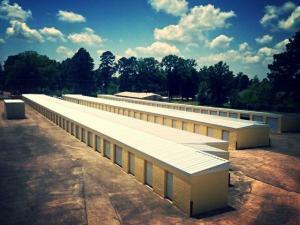 Cool metal roofing offers both environmental and economical savings! Metal roofs result in energy savings by reducing HVAC operating costs and our environment is saved by using a recyclable product. Metal roofs are durable, sustainable and provide a modern flair to the exterior of your property while creating an energy efficient interior. Metal roofing is available in a wide array of product types and styles including standing seam, screw down and “R” panel. Because there is such a wide array of metal roofing products, there is also a wide price range. The cost of a metal roof will be higher than a shingle roof, but has many benefits which outweigh the increased upfront expense. 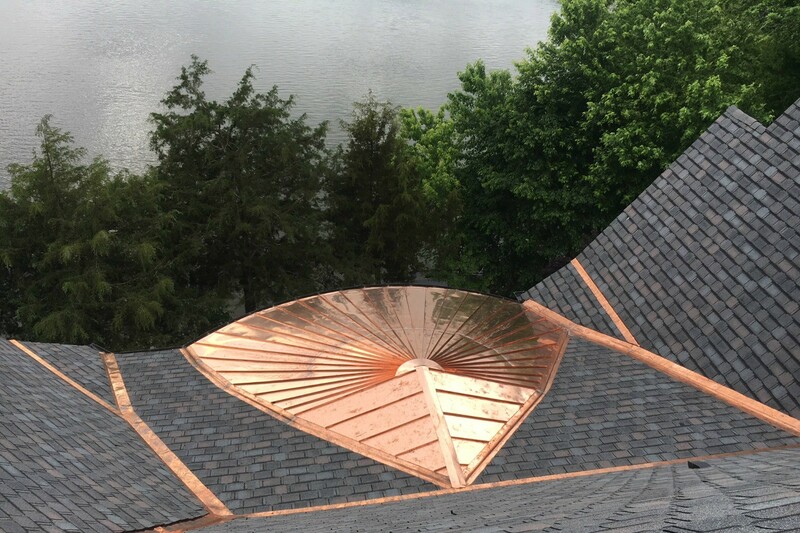 When considering the cost of a metal roof compared to a traditional shingle roof, the true cost should factor in the life-cycle cost, energy savings, insurance premium savings and impact on property value. When all factors are considered, the true cost of a metal roof is actually lower than a shingle roof and is the most cost-effective decision you can make. As an experienced metal roofing contractor, we can provide you with guidance on the best type of metal roof for your commercial roofing needs or residential home. A metal roof is still a considerable investment, so it is critical that you do not leave things to chance. We are experienced metal roofing contractors! The roofing company you hire to install your metal roof should be knowledgeable and experienced! MidSouth Construction backs every metal roof we install with a written warranty, exceptional commitment to customer service and a solid reputation. Contact MidSouth Construction today to discuss your metal roofing needs! We are experts at custom sheet metal roofing for all types of structures including church steeples! What Are The Pros to Metal Roofing? 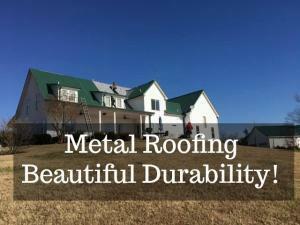 Top Rated Metal Roofing Company in Nashville! Metal Roofing can enhance the curb appeal and beauty to any home. From affordable metal ribbed panels to the sleek durability of standing seam metal roofing – there is a metal roof option that fits you specific roofing needs and budget! A standing seam roof is the highest quality and overall best value in metal roofing. The heavy gauge commercial panels require little to no maintenance throughout the long life expectancy. Standing seam roofing is a great option for any type of roofing project including commercial, industrial or even residential. It is the most recognized type of metal roofing. Typically, a standing seam metal roof will not be the least expensive type of metal roof to install. However, when you consider the low maintenance, repairs and long life expectancy, the advantages of a standing seam roof are obvious for many commercial property owners. Each panel is custom formed to fit your specific commercial roofing project and come in widths of 12 to 19 inches. Panels are connected by fastening together a raised seam that is between the panels and can be .5″ to 1.5″ high. The raised standing seams are one of the many advantages to installing a standing seam metal roof. The weak point of any roof is where there are seams. Seams can run horizontal as well as vertical. The seams of a standing seam roof are raised above the level of the roof panel, which eliminates this moisture entry weak point. In addition, there are fewer seams in a standing seam roof because the custom metal panels run continuous from the top of the roof line to the eves so there are no horizontal seams. The combination of fewer seams and the raised seams make a standing seam roof extremely low maintenance and virtually leak proof. However, the benefits of investing in a standing seam roof all hinge on the proper installation of the panels. There are a lot of contractors that claim to install metal roofing, but few are qualified to install the panels correctly. It takes a knowledgeable and experienced roofing contractor install a standing seam metal roof properly. You should be wary of a roofing contractor who gives a low estimate for a metal roof project. 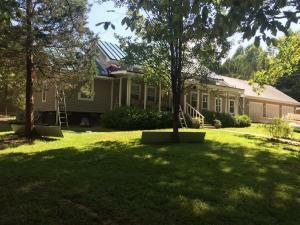 A standing seam metal roof that has been installed improperly will ultimately be the most expensive. Standing seam metal roofing offers a contemporary distinctive look that has become extremely popular. It is installed with continuous panels that run from the roof ridge to the eve and are connected with raised seams and concealed fasteners. The end result is a worry-free, virtually leak proof metal roofing system that will provide a lifetime of durability. The R Panel metal roof is another durable option to conventional roofing. It can be installed over existing shingles which saves on time, labor and disposal costs resulting in a very cost effective project. “R” panel roofing is also referred to as corrugated roofing or sheet metal roofing and is seen most often in the agricultural arena. Most “R” panel metal roofing is made of galvanized steels that range between 24 to 30 gauges. “R” panel roofing consists of large sheets of various lengths and widths that overlap and have exposed fasteners. The fasteners are driven through the panels where they overlap and driven directly into the roof decking, purlin, or lathing strips. 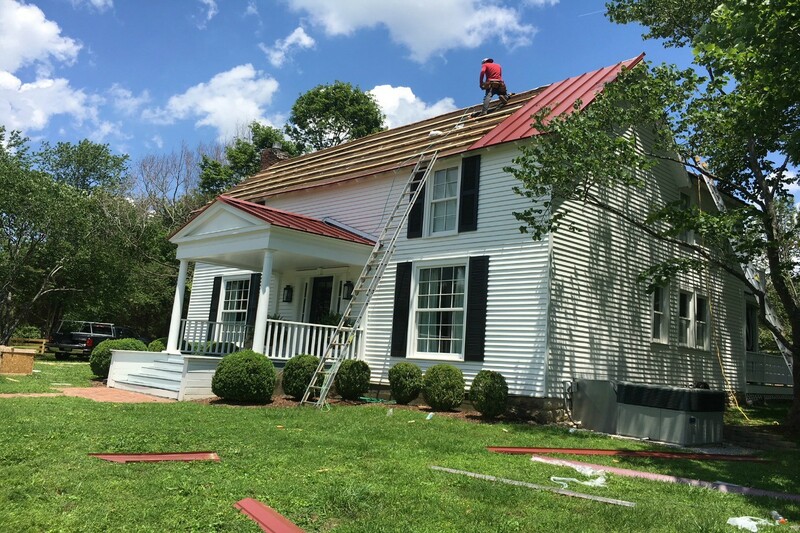 Sheet metal roofing is most often used for agricultural or rural type properties and is occasionally used in order to achieve a historical look. “R” panel metal roofing can be painted or unpainted and comes in a wide range of colors. However, the paints used on this type of roofing are more economical which means lower quality than the colors of a standing seam panel and typically have a 30 year warranty on the paint. 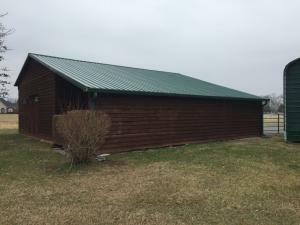 Even though the fasteners and paints may be considered lower quality, this type of metal roofing is still a higher quality product than a traditional shingle roof. Visit our Portfolio page for metal roof projects that we have completed as metal roofing contractors! We want to be the metal roofing contractors selected by you for your commercial roof or residential property needs. Metal roofing contractors rated number one in Nashville!! A Screw down metal roof refers to metal panels that are fastened by screwing or nailing through the metal panel itself into the deck, purlin, or lathing strips. The fasteners are exposed and are usually driven through the overlap between panels. The fasteners are self-drilling screws with a neoprene washer and oversized head which allows for water tightness. The screws are painted to match the metal panels but will still be visible. 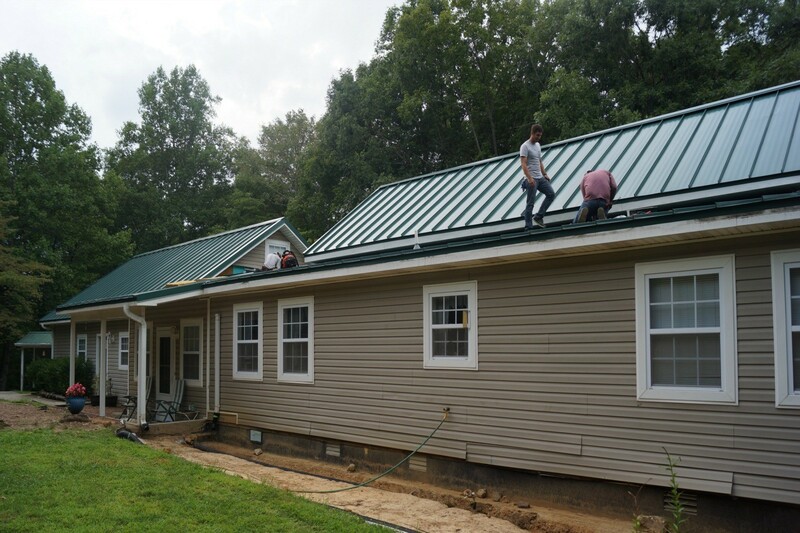 A screw down metal roof is a less expensive option compared to a standing seam metal roof. However, with the lower price you also receive a less sleek design and lower quality fastener system. Since the exposed fasteners are exposed to the elements they are more likely to break down over time which can lead to more maintenance and moisture entry points. 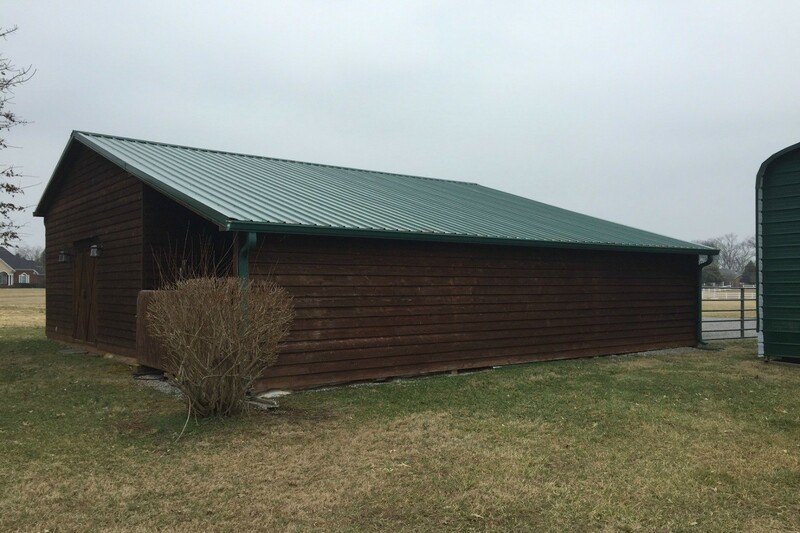 A screw down metal roof is still an excellent option for someone who wants the look and durability of metal but does not have to budget to cover the cost of a standing seam metal roof. The screw-down metal roof and screw-down wall panels have been the backbone of the metal roofing industry since it was first introduced in the roofing market. Despite newer metal roofing products, it still stands as a significant portion of the total metal roofing market today. Call us today for a free quote for screw-down metal roofing! 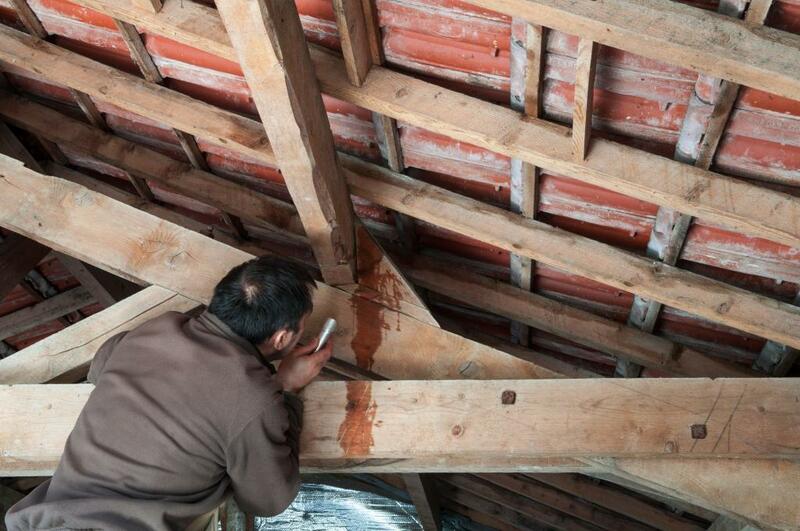 Our metal roofing contractors are experts at finding leaks in metal roofs! We also provide free metal roof inspections! Metal roofing contractors certified to repair or replace standing seam metal roofing, or ribbed panel roof on homes or businesses! Metal roof experts!